President Moon Jae-in held a rare meeting with citizens Thursday, largely to listen to their concerns over economic conditions sparked by a planned minimum wage hike. 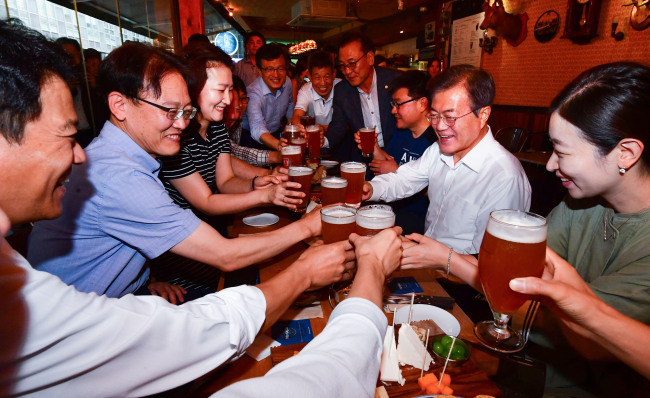 The special meeting began at 7 p.m. at a pub in the downtown Gwanghwamun area, involving some 30 people, including job seekers and owners of small and medium-sized businesses, such as a convenience store, according to the presidential office Cheong Wa Dae. "I promised to communicate with the people, to meet with citizens after work during my election campaign," the president said of reason for the meeting. "Recently, the minimum wage and employment have become serious issues, so I came without preparing any message today and only to listen to what our workers had to say," he added, according to Cheong Wa Dae pool reports. The participants had been pre-selected but were unaware of their meeting with the president until the last minute, Cheong Wa Dae said, adding that the people were earlier told they were meeting with a government minister to discuss the proposed minimum wage increase. Thursday's meeting came after the Minimum Wage Commission decided to raise the minimum wage to 8,350 won ($7.4) per hour from the start of next year, up 10.9 percent from the current 7,530 won. The proposed increase has prompted serious concerns from local businesses, especially small and medium-sized firms, over increased labor costs. It follows a record 16.4 percent wage spike that went into effect at the start of this year. Many experts say a steep increase in the minimum wage may hurt small companies, especially small shop owners, and thereby slow down the entire economy. Moon, however, has apologized for what he called a less-than-expected increase in the minimum wage, noting the proposed increase for 2019 will make it impossible to realize his pledge of 10,000 won per hour by 2020. The minimum wage hike is closely linked to Moon's key economic policy of income-led growth, which seeks to create a virtuous cycle of increased income and increased spending that he says will lead to overall economic growth. Some of the participants explained their own difficulties caused by the minimum wage hike, as well as the mandatory reduction of working hours to 52 hours per week. Byun Yang-hee, the owner of a small business that specializes in packed meals, cited difficulties in finding workers, noting most part-time workers now seemed to prefer easier jobs for the same wage. The self-employed business owner also cited a significant cut in sales caused by an apparent reduction in the number of customers who work late due to the reduction in working hours. Jeong Gwang-cheon, who introduced himself as the chief executive officer of a small IT firm, questioned the very need to raise the minimum wage to 10,000 won across the entire nation, noting the same amount of money may have different buying power in different areas. The president acknowledged the minimum wage increase may create great problems in some areas but be less of a burden in others. "The minimum wage issue may be taken differently in different areas just as prices differ in Seoul and in other areas. On the other hand, the minimum wage is designed to help those who are unable to make enough to make a living, and so allowing different wages depending on the area and occupation may go against the very purpose of setting a minimum wage," Moon said. Still, the president said the government will hold discussions on such issues in the future. The special meeting with the people ended after one hour, as previously scheduled. However, the president agreed to hold an impromptu meeting with another group of people who happened to be in the area and asked to speak with him.